Swarming is honey bee colonies' natural means of reproduction. In the process of swarming the original single colony reproduces to two and sometimes more colonies. For instance, one species of honey bee that participates in such swarming behavior is Apis cerana. The reproduction swarms of this species settle 20–30 m away from the natal nest for a few days and will then depart for a new nest site after getting information from scout bees. Scout bees search for suitable cavities in which to construct the swarm’s home. Successful scouts will then come back and report the location of suitable nesting sites to the other bees. Worker bees create queen cups throughout the year. When the hive is getting ready to swarm, the queen lays eggs into the queen cups. New queens are raised and the hive may swarm as soon as the queen cells are capped and before the new virgin queens emerge from their queen cells. A laying queen is too heavy to fly long distances. Therefore, the workers will stop feeding her before the anticipated swarm date and the queen will stop laying eggs. Swarming creates an interruption in the brood cycle of the original colony. During the swarm preparation, scout bees will simply find a nearby location for the swarm to cluster. When a honey bee swarm emerges from a hive they do not fly far at first. They may gather in a tree or on a branch only a few metres from the hive. There, they cluster about the queen and send 20 - 50 scout bees out to find suitable new nest locations. This intermediate stop is not for permanent habitation and they will normally leave within a few hours to a suitable location. It is from this temporary location that the cluster will determine the final nest site based on the level of excitement of the dances of the scout bees. It is unusual if a swarm clusters for more than three days at an intermediate stop. The propensity to swarm differs between the honey bee races. Africanized bees are notable for their propensity to swarm or abscond. Absconding is a process where the whole hive leaves rather than splits like in swarming. Being tropical bees, they tend to swarm or abscond any time food is scarce, thus making themselves vulnerable in colder locales. Mainly for lack of sufficient winter stores, the Africanized bee colonies tend to perish in the winter in higher latitudes. Generally, a weak bee colony will not swarm until the colony has produced a larger population of bees. Weak bee colonies can be the result of low food supply, disease such as Foulbrood Disease, or from a queen that produces low quantities of eggs. The scout bees are the most experienced foragers in the cluster. An individual scout returning to the cluster promotes a location she has found. She uses the waggle dance to indicate direction, distance, and quality to others in the cluster. The more excited she is about her findings the more excitedly she dances. If she can convince other scouts to check out the location she found, they may take off, check out the proposed site, and may choose to promote the site further upon their return. Several different sites may be promoted by different scouts at first. After several hours and sometimes days, slowly a favorite location emerges from this decision making process. In order for a decision to be made in a relatively short amount of time (the swarm can only survive for about three days on the honey on which they gorged themselves before leaving the hive), a decision will often be made when somewhere around 80% of the scouts have agreed upon a single location, and/or when there is a quorum of 20-30 scouts present at a potential nest site. When that happens, the whole cluster takes off and flies to it. A swarm may fly a kilometer or more to the scouted location, with the scouts guiding the rest of the bees by quickly flying overhead in the proper direction. This collective decision making process is remarkably successful in identifying the most suitable new nest site and keeping the swarm intact. A good nest site has to be large enough to accommodate the swarm (minimum 15 liters in volume, preferably ≈40 liters), has to be well protected from the elements, have a small entrance (approximately 12.5 cm squared) located at the bottom of the cavity, receive a certain amount of warmth from the sun and not be infested with ants. In addition to these criteria, nest sites with abandoned honeycombs are preferred, as this allows the bees to better conserve their resources. Beekeepers who do not wish to increase their number of active hives may use one or more of many methods for swarm control. Most methods simulate swarming to extinguish the swarming drive. Clipping one wing of the queen. When one wing of the queen is clipped, a swarm may issue but due to the queen's inability to fly, the swarm will gather right outside the original hive, where the swarm can be easily collected. Even though this is not a swarm prevention method it is a method of swarm retrieval. In the Demaree method a frame of capped brood is removed with the old queen. This frame is put in a hive box with empty drawn frames and foundation at the same location of the old hive. A honey super is added to the top of this hive topped by a crown board (known as an "inner cover" in America). The remaining hive box sans queen is inspected for queen cells. All queen cells are destroyed. This hive box, which has most of the bees, is put on top of the crown board. Foraging bees will return to the lower box depleting the population of the upper box. After a week to ten days both parts are inspected again and any subsequent queen cells destroyed. After another period of separation the swarming drive is extinguished and the hives can be re-combined. Simply keep the brood nest open. In preparation for swarming, bees fill the brood nest with honey. The queen stops laying to be trim enough to fly, and her newly unemployed nurse bees go with her. The concept of this method is to open the brood nest to employ those nurse bees and get the queen laying again and redirect this sequence of events. This is done by any number of slight variations from empty frames in the brood nest, frames of bare foundation in the brood nest or drawn combs in the brood nest, or moving brood combs to the box above to cause more expansion of the brood nest. Checkerboarding. In the late winter, frames are rearranged above the growing brood nest. The frames above the brood nest are alternated between full honey frames and empty drawn out frames or even foundationless frames. It is believed that only colonies that perceive to have enough reserves will attempt to swarm. Checkerboarding frames above the brood nest apparently destroys this sense of having reserves. Alternatively, there are also swarm traps with Nasonov pheromone lures that can be used to attract swarms. Beekeepers who are aware that a colony has swarmed may add brood with eggs that is free of mites. Given young brood the bees have a second chance to raise a new queen if the first one fails. Bee swarm on tree branch in eastern Arkansas. Beekeepers are sometimes called to capture swarms that are cast by feral honey bees or from the hives of domestic beekeepers. Most beekeepers will remove a honeybee swarm for a small fee or maybe even free if they are nearby. Usually a beekeeper or bee removal company will use a bee vacuum to capture the bees in a caged container so they can be transported to a new hive. This way is easy and if done with just the right amount of suction, few bees are lost. Bee swarms can almost always be collected alive and relocated by a competent beekeeper or bee removal company. Extermination of a bee swarm is rarely necessary and discouraged if bee removal is possible. There are various methods to capture a swarm. When the swarm first settles down and forms a cluster it is relatively easy to capture the swarm in a suitable box or nuc. 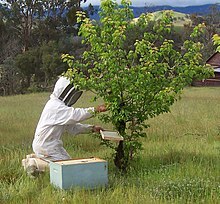 One method that can be employed on a sunny day when the swarm is located on a lower branch or small tree is to put a white sheet under the swarm location. A nuc box is put on the sheet. The swarm is sprayed from the outside with a sugar solution (soaks the bees so they become too heavy to fly away) and then vigorously shaken off the branch. The main cluster, hopefully including the queen, will fall onto the white sheet and the bees will quickly go for the first dark entrance space in sight, which is the opening of the nuc. An organized march toward the opening will ensue and after 15 minutes the majority of bees will be inside the nuc. This capture method does not work at night. If the swarm is too embroiled in its perch so it cannot be dropped into a box or sheet, a skep can be suspended over it and gentle smoke used to "herd" the swarm into the skep. Smoke is not recommended to calm a clustered swarm. Smoke will have the opposite effect on a clustered swarm as many bees will become agitated and fly about instead of settling down. A beekeeper collecting a bee swarm. A swarm of bees sometimes frightens people, though the bees are usually not aggressive at this stage of their life cycle. This is principally due to the swarming bees' lack of brood (developing bees) to defend and their interest in finding a new nesting location for their queen. This does not mean that bees from a swarm will not attack if they perceive a threat; however, most bees only attack in response to intrusions against their colony. Additionally, bees seldom swarm except when the position of the sun is direct and impressive. Swarm clusters, hanging from a tree branch, will move on and find a suitable nesting location in a day or two. Encountering a bee swarm for the first time can be alarming. Bees tend to swarm near their hives or honeycombs, so if a swarm is visible then a nest is nearby. Swarms are usually not aggressive unless provoked, so it is important to keep a good distance from swarms in order to avoid provoking them. ^ Villa, José D. (2004). "Swarming Behavior of Honey Bees (Hymenoptera: Apidae) in Southeastern Louisiana". Annals of the Entomological Society of America. 97 (1): 111–116. doi:10.1603/0013-8746(2004)097[0111:SBOHBH]2.0.CO;2. ^ Avitabile, A.; Morse, R. A.; Boch, R. (November 1975). "Swarming honey bees guided by pheromones". Annals of the Entomological Society of America. 68 (6): 1079–1082. doi:10.1093/aesa/68.6.1079. ^ Miller, Peter. "Swarm Theory". National Geographic. Retrieved 6 April 2013. ^ Seeley, Thomas D. The wisdom of the hive: the social physiology of honey bee colonies. Harvard University Press, 2009. ^ Seeley, Thomas D.; Visscher, P. Kirk (September 2003). "Choosing a home: How the scouts in a honey bee swarm perceive the completion of their group decision making". Behavioral Ecology and Sociobiology. 54 (5): 511–520. CiteSeerX 10.1.1.112.4277. doi:10.1007/s00265-003-0664-6. ^ Morse, Roger A. (July 1963). "Swarm Orientation in Honeybees". Science. 141 (3578): 357–358. doi:10.1126/science.141.3578.357. PMID 17815993. ^ Seeley, Thomas (May 2003). "Consensus building during nest-site selection in honey bee swarms: the expiration of dissent". Behavioral Ecology and Sociobiology. 53 (6): 417–424. doi:10.1007/s00265-003-0598-z. JSTOR 4602235. ^ Seeley, Thomas (2010). Honeybee Democracy. Princeton, NJ: Princeton U Press. ISBN 978-0-691-14721-5. ^ "Honey Bee Swarms". University of Nebraska-Lincoln. Archived from the original on 9 May 2013. Retrieved 6 April 2013. ^ "Bee Control Tips". Bee Removal Specialists. Retrieved 6 April 2013. ^ "Bee Removal Photo Gallery". www.dteklivebeeremoval.com. Retrieved 30 August 2015. ^ "Bee swarm delays Astros' victory over Padres". Associated Press. July 2, 2009. ^ Mussen, E. C. "Removing Honey Bee Swarms and Established Hives". UC Statewide IPM Program, University of California, Davis. Retrieved 6 April 2013. This page was last edited on 4 February 2019, at 20:00 (UTC).